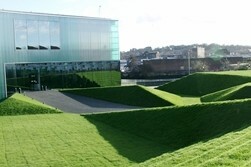 The award winning Laban building is an awe-inspiring landmark offering a spectacular backdrop for events. Situated just 20 minutes from Central London by road or DLR, by day and by night the venue is dramatically different: by day the building’s translucent outer skin allows natural daylight to flood through it, throwing energising white and coloured light into the interior space. By night, the building becomes a striking coloured beacon, with light and movement spilling out, illuminationg the surrounding area. 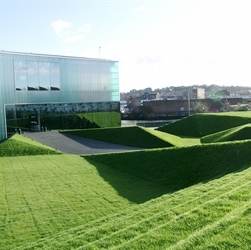 Dubbed ‘the coolest piece of architecture in the capital’ by the Evening Standard, Laban is an immaculate new venue that will guarantee your event is the one people are talking about. The Foyer – (or Main Street), a contemporary ramped concourse area, incorporating a modern bar area seating 40 people. Ideal for drinks receptions, presentation and standing buffets for up to 400, the foyer can be complimented by live or recorded music and film projection. The Outdoor Theatre & Gardens – In an area totalling 600 square metres, the ‘folded’ landscaped gardens incorporate the exclusive 200 seat Outdoor Theatre. Studios – Purpose built for professional dance training, the 12 studios can be used as adaptable rooms for a variety of functions including meetings, small conferences, dinners and evening receptions. The Bonnie Bird Theatre – Designed in elegant dark wood, the sleek theatre space is hidden in the heart of the building and seats 294, plus 2 wheelchair spaces. This space is ideal for product and press launches, conferences, award ceremonies and other creative events. Lecture Theatre – Seating up to 96 and designed in a light birch wood, this is an ideal setting for smaller conferences, seminars and presentations. Meeting and Conference Rooms – These are perfect for smaller business meetings and can be used as breakout rooms or office space in conjunction with a main event in a larger area.